"...a degree of polish and refinement that is extraordinary...even to a critical ear that has heard the great orchestras of the world." 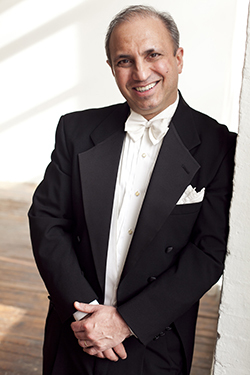 Markand Thakar is Music Director of the Baltimore Chamber Orchestra. A former assistant conductor of the New York Philharmonic, Maestro Thakar's appearances include concerts and a national radio broadcast with that orchestra; as well as concerts with the National, San Antonio, Columbus, Fort Worth, Alabama, Edmonton, Winnipeg, Amarillo, Charlotte, Wichita, Chattanooga, Knoxville, Richmond, Colorado Springs, Greensboro, Illinois, Kalamazoo, Windsor, Flint, Maryland, Ann Arbor, National Gallery, Waterbury, Annapolis, and Florida West Coast symphony orchestras; the Calgary, Louisiana, Long Island, and Ulsan (South Korea) philharmonics; and the Boston Pro Arte, National and Cleveland chamber orchestras; and opera productions with the Baltimore Opera Theater, the Teatro Lirico d’Europa, Opera on the James, and the Duluth Festival Opera. A frequent guest conductor at the Aspen Music Festival, Mr. Thakar has appeared with Yo-Yo Ma and the Colorado Symphony Orchestra and with Itzhak Perlman and the Boulder Philharmonic, and is a winner of the Geraldine C. and Emory M. Ford Foundation Award. Familiar to national radio audiences as a frequent commentator for National Public Radio's Performance Today, he has appeared on CBS This Morning and CNN conducting the Colorado Symphony. Noted internationally as a pedagogue, he was for over two decades Co-Director of Graduate Conducting at the Peabody Conservatory, and his two annual intensive conducting programs with BCO have drawn conductors from five continents. His students have won significant conducting positions across North America and internationally, including music directorships with the Aachen (Germany), Winnipeg, Hartford, Eugene, Charleston, Lubbock, Muncie, Williamsport, Amarillo, Young Musician's Foundation, Lake Forest, Mid-Atlantic, Sioux City, Waterloo-Cedar Falls, Lake Charles, Washington-Idaho, and Grande Ronde Symphony Orchestras; staff conducting positions with the Metropolitan Opera and the orchestras of Philadelphia, New York, Los Angeles, Cincinnati, Dallas, Seattle, Saint Louis, Portland (OR), Richmond, Winnipeg, Portland (ME), Buffalo, Phoenix, Charlotte, Kansas City, Canton, Winston-Salem, and El Paso; as well as numerous collegiate positions. Formerly associate conductor of the Colorado Symphony Orchestra and conductor of the Eugene Symphony's “NightMusic” pops series, Maestro Thakar was music director and conductor of the Amadeus Chamber Orchestra in New York City, the Barnard-Columbia Philharmonia, the Classical Symphony of Cincinnati, the Penn's Woods Philharmonia, and the National Festival Orchestra of the Great Lakes Festival of Musical Arts. Thakar was awarded a Fulbright fellowship for study of orchestral conducting in Romania, and is a past winner of the national Exxon Conductors Program auditions. He earned a bachelor's degree in composition and violin performance from The Juilliard School, a master's degree in music theory from Columbia University, and a doctorate in orchestral conducting from the Cincinnati College-Conservatory, and he undertook special studies in orchestral conducting at the Curtis Institute and the Ciprian Porumbescu Conservatory in Bucharest, Romania. Other conducting studies were with Gustav Meier, Max Rudolf and Peter Perret. Thakar is the author of three seminal books. On the Principles and Practice of Conducting (University of Rochester Press, 2016) is a manual for acquiring necessary and invaluable skills and understandings. Looking for the “Harp” Quartet; An Investigation into Musical Beauty (University of Rochester Press, 2011) is a journey through the experience of musical beauty from the standpoint of the composer, performer and listener. The book is described as “a 225-page tour de force,” and “an exercise in academic excellence and a seminal contribution for personal, professional, and academic classical music studies” (Midwest Book Review). Counterpoint: Fundamentals of Music Making (published in English by Yale University Press, 1990) also issued in Italian and Czech) uses species counterpoint to promote an understanding of how both composer and performer contribute to the experience of musical beauty. Thakar lives in Baltimore with his wife, violist Victoria Chiang, and their son Oliver.